Crab apples. Crab apples have a less than stellar reputation. According to my husband they are only good for childhood neighbourhood fights. According to my sister's CSA farmer, "no one eats crab apples." Eating those sour, pucker apples straight off the tree was definitely a trip down memory lane. I had to figure out something to DO with them, because eating more than five WILL give you an upset stomach. 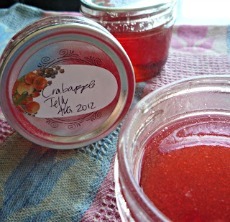 Crab Apple Jelly - a jewel like jelly that is sweet and tart at the same time. Put the apples in the pot. Add enough water to cover and cook until the little apples explode. Strain through a dishcloth. Measure how many cups of liquid you have. Add an equal amount of sugar. Boil until jell test passes. Hot water process 10 minutes. Cook 2 lbs apples in water until they burst. Strain. Add enough vinegar to make 3 cups of liquid. Add 3 3/4 cup sugar. Boil until dissolved. Slice up half a sweet bell pepper, 3 jalapenos, and 1 scotch bonnet pepper. Boil for a few minutes then strain. 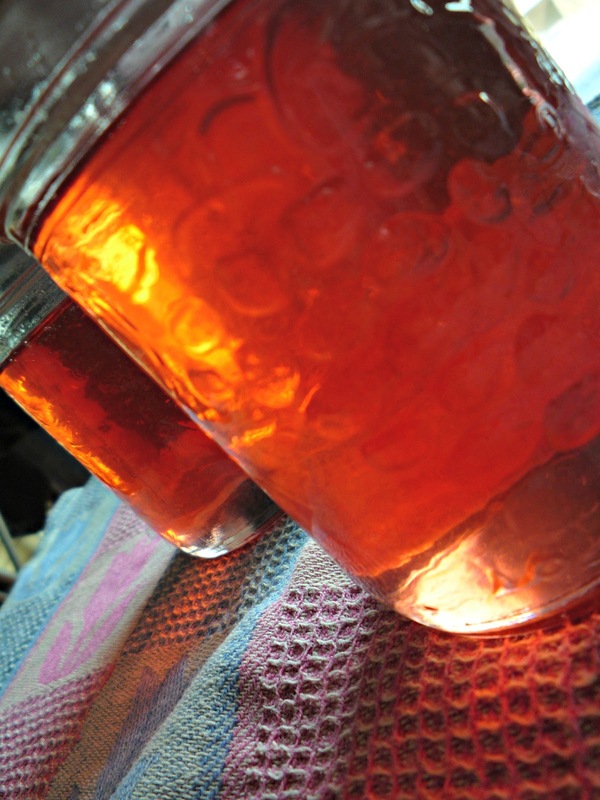 Continue to boil until mixture passes the jell test. Process for 10 minutes. I did not measure how long the pepper were in the mixture but I continued to taste test until I thought the strength was appropriate. Check out my DIY Canning post for basic canning information.